This is a great option for the Beer lovers out there. 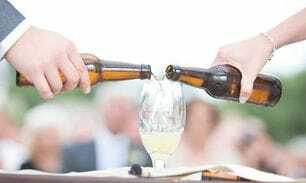 After exchanging vows you will combine your two favorite beers together symbolizing the joining of your lives. You have just committed yourselves to one another through sacred vows. Your unique selves have found one another and have become one. In honor of your uniqueness, in a moment I will be inviting ______ to bring forward two beers. One for you ______, and one for you _____. Each can will represent your individual lives, family, and your individual selves. It is important to remember that you are still an individual, however, you are now part of a stronger Indestructible team backed by a very powerful emotion known as love. Water is the essence of life, but when water is combined with grains, hops, and yeast, the outcome is glorious beer. So too shall be the product of your union. It is an unselfish union between beer’s basic ingredients that make the finished product truly magical. It is an unselfish union of beer’s ingredients that make beer truly magnificent. So too will be your marriage. Love is the water of your beer. Trust is the grain that will give your marriage its character and strength. Passion, like hops, will add fragrance and spice to your life together. Your commitment to one another is the yeast that acts as the catalyst to make this glorious union—this metaphysical wonder—possible. Now that the yeast has been added and the fermentation of your love has begun, there are vast changes ahead. Open your hearts wider than they have ever been opened before and rise up to meet these changes. As you drink your Corona consume these changes. Let them fill your spirits and intoxicate your souls. Abandon all previous disappointments and past events that may have held you back and look toward your future with one fresh spirit, with one fresh love, with one fresh beer. As you pour your beers together you will be representing your two individual selves becoming one, creating a life that is richer and more magnificent than your lives alone.